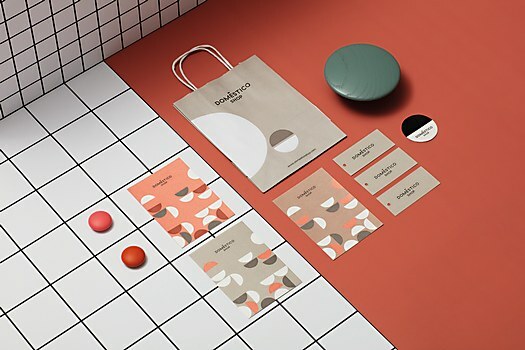 Mucho’s new identity for Doméstico Shop plays with the visual language. 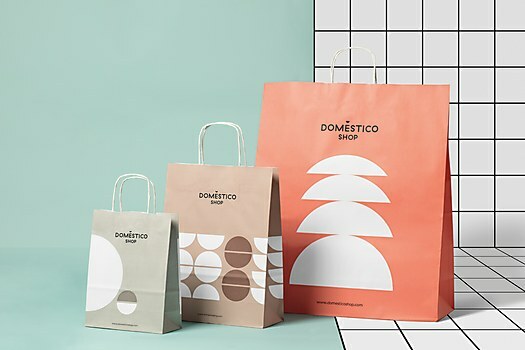 Background: Doméstico Shop, a successful online furniture shop based in Spain, needed a strong rebrand that would accurately represent the shop, but not overpower the current furniture brands being sold. As the shop sells some of the best contemporary furniture brands, it was necessary for Doméstico to generate a visual language that would express itself differently depending on the different lines of shops and showrooms. Reasoning: The original Doméstico Shop symbol had just a “D” as a symbol. 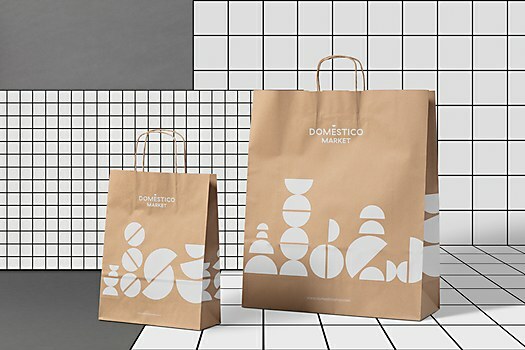 Since it is difficult to incorporate the accent in the “e” in Doméstico Shop’s name, the idea was to make virtue of the limitation and use a solid semicircle as part of the logotype. 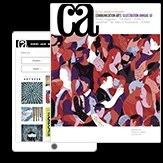 The accent is still there, but now, it acts like a little symbol that coronates the brand—a minimalist crown. It refers to the old D, and it allowed us to use the semicircle as a basic element to develop the visual language. Once we had the semicircle, we decided to play with it in two different ways. For the shop, we composed abstract shapes and patterns, and with the ‘Market,’ we wanted to somehow represent shelves of products that have been piled. 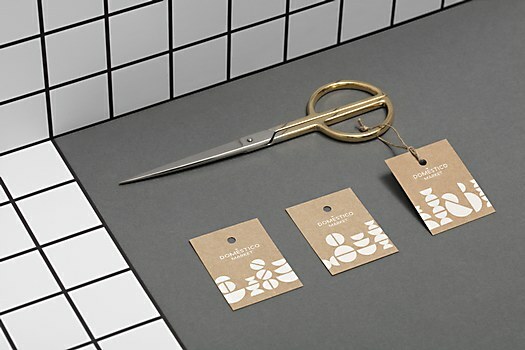 Challenges: Working together with the sophisticated and expert team at Doméstico Shop. 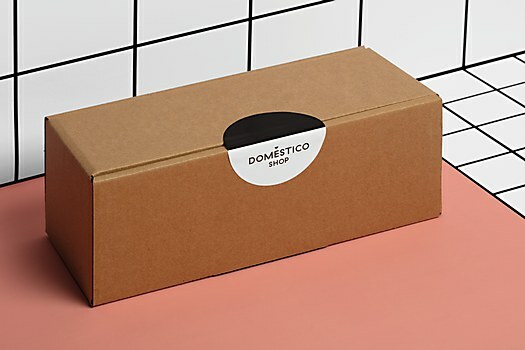 We worked hard to find a solution that still felt like the Doméstico Shop brand, but different enough for the furniture shop to feel it was taking a step forward. Favorite details: I think the visual language we have developed will let Doméstico Shop explore the shapes and compositions for a long time. It will be fun to see how it evolves. 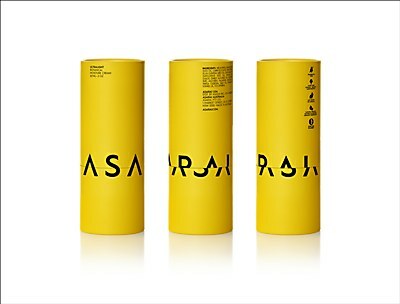 mousegraphic’s bright yellow packaging for Asarai both astounds and challenges the previous design canon. 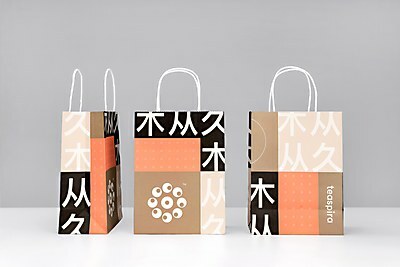 ori.studio’s identity for Teaspira mixes a quirky color palette with traditional Chinese heritage. Once Films and The Spotlight Series’s short film “Barrel,” invites viewers to witness the process of creating barrel aged beard and tattoo oils.